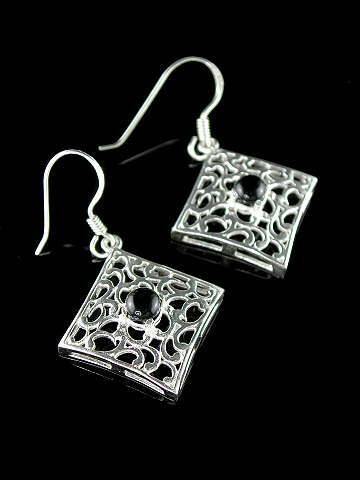 Beautiful geometric Black Onyx cabochon earrings in an open filigree-style design set in 925 Sterling Silver. Onyx is part of the Agate family, and although most commonly found in black or white, it can also be grey, blue, brown, yellow and red. Onyx is known as the Stone of Strength - mentally and emotionally; giving support to the wearer during difficult or trying times. It is said to bring the masculine and feminine parts of our nature into balance and can bring strength where fear is present.